Dust pollution in Europe is considerably more serious than known in the public! Examining the new report “Air quality in Europe 2013”, we discovered these surprising news. The reason is that a phenomenon called “non-exhaust PM,which is caused by road traffic, should be added to the figures about fine and ultra-fine dust (PM), as the European Environment Agency has pointed out in its report. The report was published last week. But it lacks detailed data about the problem. Epidemiological studies however attribute most severe health effects of air pollution to all sorts of PM (Particulate Matter, PM 10 and PM 2,5). And so, the lack of data is quite astonishing. The good news: “Non-exhaust PM” is strongly influenced by speed and so a 30 km/h speed limit will be a powerful contribution to reduce the problem. The EEA report reveals that around 90 % of city dwellers in the European Union (EU) are still exposed to at least one of the most damaging air pollutants at levels deemed harmful to health by the World Health Organisation (WHO). The European Union is far from reaching its goals for environment and health protection. „Forgotten “ PM – just a detail? The report describes the most serious air pollutants which are particulate matter (PM), ozone (with precursors NOx and NMVOC) and nitrogen dioxide (NOx). They can cause respiratory problems, cardiovascular diseases and contribute to the acidification of soil and surface water, and damage vegetation. Road traffic is among the biggest contributors to these pollutants. But concerning the PM, the EEA was not able to integrate the “non-exhaust PM” into their stats because some member states simply did not provide them with the data needed. Instead, the report has more general information about the dimension of the phenomenon suggesting that “non-exhaust” PM equal 50 percent of the traffic-caused PM10 (<=10 mikrogram) and another 22 percent of traffic-caused PM2,5 (<= 2,5 mikrogram). This means 200 000 tons that should be added to the stats! We feel that this amount of dangerous pollution is too huge to be “forgotten” any more. EEA-Report, p.39. modified by dashed lines indicating added non-exhaust PM . 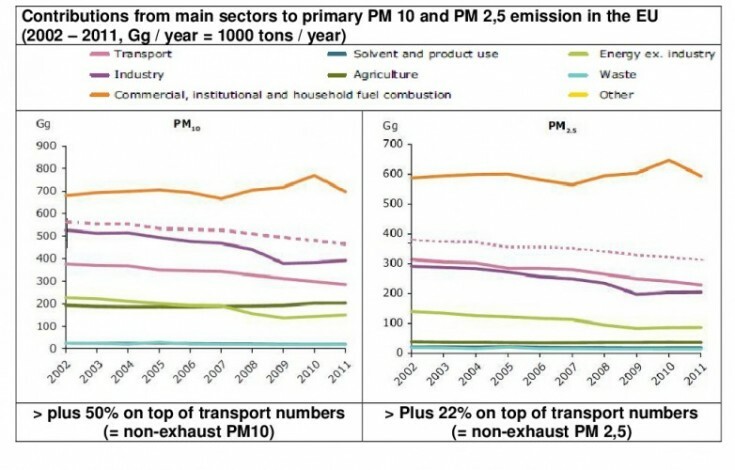 If „non-exhaust PM“ were included the transport sector would be the second largest PM emitting sector, with significantly higher emission rates. > High time to better take regulation into consideration. The EEA points out that in the EU, there is no current regulation with regard to non-exhaust PM whereas some measures are taken to combat pollution caused by exhaust PM. The result? “It has been shown that even with zero tail-pipe emissions, traffic will continue to contribute to fine and ultrafine particles through non-exhaust emissions (Dahl et al., 2006; Kumar et al., 2013) and it is estimated that nearly 90 % of the total PM emissions from road traffic will come from non-exhaust sources by the end of the decade (Rexeis and Hausberger, 2009).”, says EEA. Firstly, a slower speed reduces tyre wear and road abrasion. Secondly, a more constant traffic flow reduces tyre wear and use of brakes. Thirdly, a less aggressive speed reduces all, tyre wear, brake wear and road abrasion. Fourthly, a default urban 30 km/h speed for the whole continent be possible, this would influence people to buy lighter and smaller cars and thus further reduce road abrasion. And last but not least, less dust from the road surface will be re-dispersed. As non-exhaust PM are generated close to people and not distributed into the fresh air like exhaust pollutants are, it is very important to reduce them as fast as possible. A default 30 km/h speed limit for all European city will help a lot! And so we can expect that our efforts will finally make the difference. The EEA collects and assesses data from all relevant air pollutants. In December 2007, they added non-exhaust PM to their COPERT programme (COmputer Programme to calculate Emissions from Road Transport) – good conditions to carefully assess these pollutants. The EEA mentioned non-exhaust PM in several annual reports about air quality in Europe. However, they have not been able yet to provide the public with concrete data other than the general dimensions because data sent from certain member states have been unsufficient. The EEA also informs about up-to-date studies dealing with non-exhaust PM. S.42: As exhaust emissions are expected to continue to decline in the future, the contribution of non-exhaust PM to overall PM emissions is becoming increasingly important. In 2010, non-exhaust emissions of PM2.5 constituted 32 % of the emissions from the road transport sector in the EU‑27 Member States, compared to just 14 % in 1990. For PM10, the contribution has increased from 22 % in 1990 to 45 % in 2010. Rexeis, M. and Hausberger, S., 2009: “Trend of vehicle emission levels until 2020 – Prognosis based on current vehicle measurements and future emission legislation”, Atmospheric Environment (43) 3 689 – 3 698.